Asset Custom Fields help to add additional properties to the various Assets in your inventory. Available in Enterprise or higher pricing plan. Note: "NAME" and "DISPLAY ID" form a part of the default fields, and hence cannot be modified or removed. How to create a new Asset Custom Field? Go to Assets >> Settings >> Asset Fields. Click the "+" icon to create a new asset custom field. Enter the Name, Description, Type, Required(Yes/No) and the help text for agents for your Custom Field. Name, Type and Required (Yes/No) are mandatory. Click "Create" to create the Asset Custom Field. Click on the Asset field you would like to modify. The "Quick-Edit Section" would slide in from the right. 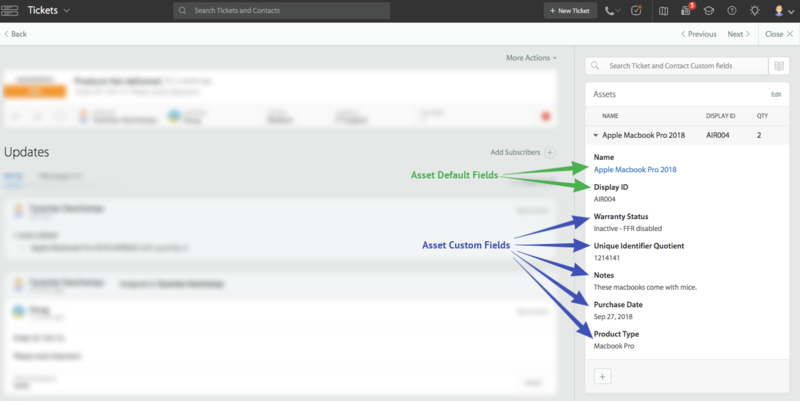 Make necessary changes to the asset field and click "Save" to update the field. Note: You cannot modify the Asset field type. Click on the Asset field you would like to delete. The "Quick-Edit Section" would slide in from the right. Click "Delete" at the top right corner of the "Quick-Edit Section". You will be warned of the number of affected Assets if field deletion is initiated. Click "Delete" to confirm the deletion process. Click on "Reorder fields" on the top right. Choose a preset sort order - to sort the fields by a predefined logic. Drag to re-order the custom field as per your wish. Click "Update order" to update the Asset field order.